Mayor Steve Williams told a lowly attended (in person) work session Thursday about his new two part stormwater recommendation. Only four members attended. The administration has completely rethought the earlier start up plan. Under his Water Quality ordinance package, the municipal service fee would be reduced 10%. This represents the removal of floodwall services from fee collections. “Let’s not confuse the two, the revision means we will not pay twice for the floodwall,” the Mayor said. 1.05 for every 1,000 square feet of impervious (i.e. manmade structures that result in water runoff). A cap would be placed after 1,000,000 square feet. 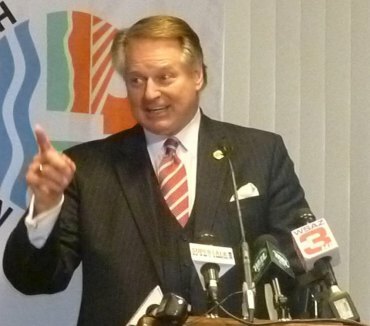 Alluding to the January proposal, Williams explained that “we assembled a team of advisors who provided greater efficiencies than January.” The work group consisted of representatives of Marshall University, Cabell Huntington Hospital, St. Mary’s Hospital, Steel of W.Va., the Chamber of Commerce, pastors and real estate developers. Following three meetings and nine hours of discussions, they worked with Lou Akers, director of the Huntington Sanitary Board, to bring the parties together. Before the square footage portion would be implemented on business, after new mapping is completed. Akers indicated that he was proud to be living in Huntington “to do the right thing” on the infrastructure matters, as well as the sanitary board handling cleaning o catch basins and the floodwall. Due to the low attendance at the work session, Williams indicated that he would elaborate more fully on the proposal at the Monday, June 9 city council meeting. The complete Water Quality proposal can be downloaded below.